Born August 6, 1953 in Monterrey Mexico. He got a Bachelors Degree in Economics at the Instituto Tecnologico y de Estudios Superiores de Monterrey in 1968. He started painting as a child and though he never had any formal education in art he has gone on to become a noted figure in contemporary Mexican painting. 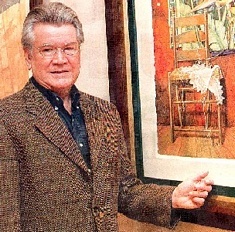 His watercolors are his signature work and they have been exhibited since 1982 in cities such as South Padre Island, TX, Mexico City, San Antonio, TX, New York City, NY, Guadalajara, Monterrey, Los Angeles, CA, Sausalito, CA, Phoenix AZ, and Vancouver Canada.